Despite the presence of tools that make content marketing a whole lot more accessible, it’s still not a marketing approach for the faint-hearted. Building an audience, creating and distributing content, and actually compelling your readers to take a desired action… well… it takes a huge effort! It’s not all doom and gloom though. There is one platform, right under your nose, that can seriously reduce your workload, and improve results. If you’ve been living under a rock, here’s a brief description. Quora is a Q-A site where users ask questions, and Quora community members both answer and upvote the most useful responses. With 500 million users visiting Quora every month, and some big names chiming in on the platform, Quora is a big deal. And it’s here to stay. A few other things set Quora apart from competing Q-A style platforms as well. High quality answers from knowledgeable sources. Ask a question about books and Canadian President Justin Trudeau himself may respond! You can directly communicate with your target audience and ask questions. Huge number of topics covered. It’s a veritable goldmine for new content ideas. Quora questions often rank quite high in Google search results. Building a follower base is quite easy with high-value content and planning. 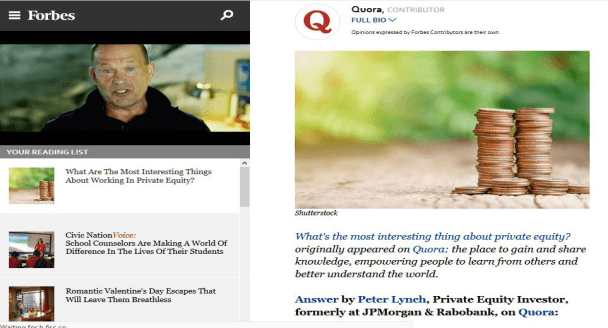 In a nutshell, Quora is worthy of being an important part of your content marketing strategy. Unlike any other social media platform, Quora is solely based on knowledge base content. That makes it a perfect stage for content marketing and branding. Why do you think Neil Patel even bothers to write 2500+ word long answers on Quora? No joke, check out the link! Here’s an in-depth look at some of the reasons you should seriously consider using Quora if you’re not already. Very few platforms beat Quora in terms of organic reach. 500 million people already visit the site every month. It is now available in 5 language which expands its reach even further. Quora feed and Quora email digest also do a great job of pushing your content out to countless readers. Better discoverability. People will often continue to stumble upon your answers months after you posted. Long story short, Quora can give you access to huge audiences, and it’s essentially free. Write great answers, and build a following. Then you can start to see those followers make their way to your site and build some brand loyalty. Take the example of Wishpond. They received 10k visitors/month alone from Quora in 2015. For the record, Quora’s traffic in 2015 was close to one-fourth of its 2018 traffic numbers. I’ll let you do the math. Everyone on Quora starts with 0 followers. It doesn’t matter if you’re the CEO of a fortune 500 company, or a college student writing from your mom’s basement. A level playing field makes for a great equalizer. Responses are generally judged and upvoted (or forgotten) based upon their merit. So if you come up with insightful answers on a consistent basis, Quora users will start to seek your expertise specifically. Top Writers can get literally thousands of “answer requests” from Quora audience members. With some great answers and a unique writing voice, you too can grow from 0 to thousands of followers in short order. Don’t just take my word for it. Look at these examples of Quora writers that snowballed their way to thousands of followers within a few short months. Asim Qureshi: A tech entrepreneur. He earned 63k followers to date, with only 549 answers. Sean Kernan: He’s known for his humorous writing style, and has tallied up 25k followers after writing only 158 responses. Hitting the 20k+ follower mark within a single year is not out of the question if you put your heart into it. Just remember to write insightful answers and provide real value. Let’s be honest about the following: Quora is not Adwords. If you have short-term acquisition targets to meet, Quora may not be the best channel for you. Rather than a quick one and done, it’s more of a long-term investment. Building authority and trust takes time and effort. With that said, once you secure a loyal reader base, Quora can absolutely become a lead generation machine. And depending on the types of queries you’re responding to, you can be earning highly qualified leads at that. 3K leads added to his email list. Quora does actually have editors. Their job is to handpick the best-written answers on various topics to republish on prestigious digital news sites like TIME, Inc., Forbes and Newsweek. You know what that means? Opportunity! You too could get featured on those mainstream media outlets. Regardless of your niche, it’s probably safe to say that it would be a big win if you landed a brand mention in one of those publications. The secret to success on Quora is a three-pronged approach. Let’s take a closer look at the three pillars necessary for your Quora efforts to be fruitful. A strong and well-optimized profile page is one of the cornerstones of any successful effort on the platform. After all, your profile page contains details about you (and/or your company) and it’s where readers will go to learn more about you. It all starts with your profile picture. Be sure to use a clear and professional profile picture. Next up, your bio section. This is your chance to write some compelling copy about your company and your achievements. Social proof (lists of sites they have been featured on). Links to their most popular content/Quora answers. One last thing worth noting here, is the “Credentials” feature. Simply put, this section can give credence to why readers should even bother reading your answers in the first place. It’s also quite easy to edit these later, if you want to switch between different credentials for your answers on different subjects. At this point, Quora is a fairly saturated platform. Meaning, there is usually going to be some competition on the most popular questions. There are also a lot of pointless questions that don’t deserve responses in the first place. Randomly picking questions and writing half-baked answers isn’t going to move the needle in 2018. Instead, take care with what questions you decide to spend time answering. And for the sake of the community at large, just skip questions if you don’t have anything of value to add. The best questions are going to be both relevant and have a good follower to answer ratio. Relevance to your business and target audience. As a content marketer, aim for the question and topics relevant to your industry or your target audience. Start by focusing on the keywords you want to rank for directly. Just type the keywords into the search box and start making your way down the list. Now remember, Google loves Quora. Often Google will rank Quora questions at the very top of the search results page for certain long-tail keywords. For example, go do a search for “best onboarding software for SaaS”. Unless something changes with Google’s algorithm by the time of this article’s publication, you should see the Quora in the top-ranking spot. So experimenting with different keywords can have a cascade effect and lead to multiple successes. Another good way to mine question is to follow industry thought leaders. Just look at their “knows about” section and you’ll come across relevant topics he/she follows. Has a favourable follower answer ratio. But what’s the magic number? Does one even exist? 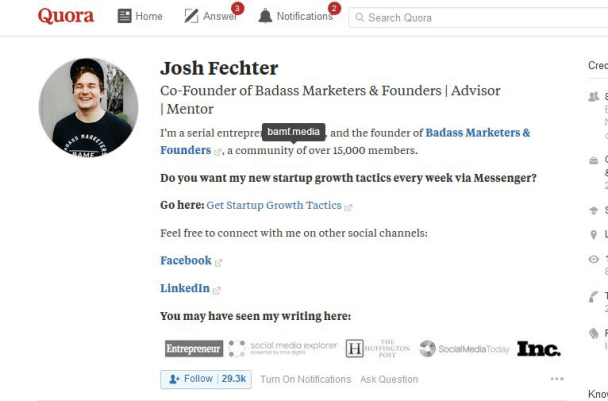 While there’s no hard and fast rule, Josh Fetcher, Quora top writer and serial entrepreneur, says that a 7:1 follower answer ratio is the sweet spot. Even if you’re tempted to answer an easy question that has no followers, try to fight the urge. Of course it may pay off occasionally, but more often than not it will be a waste of your time and energy. Are relevant to an offer you mentioned in your bio section. Have lots of followers and answers, but the answers are low quality. Cover a topic on which you can share a personal story. In general, the Quora community craves resourceful answers that are woven into the fabric of a great story. Don’t worry, it’s not actually as intimidating as it sounds. Just keep the following points in mind and you’ll do fine. Write concisely and with your own style. Tempting as it may be to just bang out a quick response and publish it right away, I’d recommend you refrain from doing so. First drafts are rarely the best examples of our writing skills. Instead, try writing out responses to a small handful of questions you found using the methods outlined earlier in this article. Then take a break before coming back later to polish those responses with a fresh set of eyes. When you get around to the editing phase, be sure to use “power words” and stick to the point. Avoid grammatical mistakes, and always thoroughly proofread the entire answer before clicking publish. Henneke Duistermaat has a great guide on how to transform a sloppy first draft into a shiny piece of content. Feel free to look at it if you’re looking to learn more. Keep in mind that Quora is a bit more “personal” than most other content platforms. A unique writing voice will generally strengthen the author-reader relationship. The most popular writers often have a distinct and recognizable writing style. Loy Machedo, for instance, has a controversial and unapologetic voice. He went from 0 to 53k subscribers with 48.8 million answer views within his first year on the platform. William Beteet offers life advice from a pragmatic point of view. His answers are often practical and hard hitting. He gained 62k subscribers with only 322 answers. Add some images to your answers. Quora’s feed is notorious for long and intimidating chunks of text. Images can work wonders to break up that monotonous pattern. The biggest names on Quora know this and use it to great effect. Some of them even treat images as part of overall branding strategy. Nicolas Cole and James Altucher frequently use distinct images of themselves. William Beteet, a stand-up comedian, uses strip comics with his answers. Ali Alshamsi loves to upload the picture of his level 100 Caterpie (yeah, that’s a Pokemon reference). Asim Quersi shares many pictures of his family, which adds a personal touch to his responses. Even if you don’t have proprietary images, you can still benefit from including stock photos, charts, before-and-after screenshots, and infographics. The options are limitless! Shameless self-promotion is a sin on Quora. Not only will users will find your responses annoying and biased, but Quora moderators are on the lookout for this kind of thing and you don’t want to get on their bad side. In short, Quora has a no spam policy. Don’t worry, there are still a few safe ways to direct readers to your site and encourage them to take a desired action. One such method is to place a relevant and transparent link in the middle of your answer without being overt self-promotional. Just be sure to provide value in your response itself, and keep your writing natural and effortless. Don’t come across like a used-car salesman. A good example would look like this. Another way to include your own brand and proprietary content is to answer a question where you can mention a handful of resources organically. Question: “What are the best marketing blogs to read in 2018?”. If you are linking your business site, avoid sending the traffic directly to a landing page with a sales pitch. Be conscientious of the user’s experience and don’t try to dupe them into clicking your link only to show them something other than what you promised on Quora. Your best bet will be to generally link to blog posts and other useful resources on your site. We covered a lot of ground. Is your head spinning? Hope not! If we’ve done a good job with this article, you’ll feel better equipped to take advantage of the incredible content-marketing opportunity that Quora represents for marketers all over the world. No doubt about it, Quora can become your number one platform for building a loyal audience and generating sales. Utilize the above approach, and start making Quora part of the top of your funnel. Remember, set up a solid profile, find the right questions to answer, and write truly useful evergreen answers that will stand the test of time. So what are you waiting for? Hop to it! Question: Why is Quora popular? Answer: Quora is popular for any number of reasons. Primarily, we’d say it’s popular because it’s an incredibly easy-to-use platform that can source relevant information and advice from experts all over the world. Question: Who should market on Quora? Answer: Any influencer or business that wants to grow their following, drive quality traffic to their website, and/or build a reputation for themselves in a particular vertical. Question: How can I market on Quora? Answer: First and foremost, by making yourself useful! Focus on finding and answering the most popular and appropriate questions for your area of expertise. Provide value that no-one else can, and try to make it personal! Question: Why use Quora for your business? Answer: Marketing on Quora is a great way to reach new audiences and to build brand awareness. If you provide useful and relevant answers, you’ll even get some fans along the way!